Technical Adviser Gernot Rohr has released a list of 24 Nigerian senior players who will battle for the three points in a 2019 Africa Cup of Nations qualifier against Seychelles in Victoria on September 7, 2018. 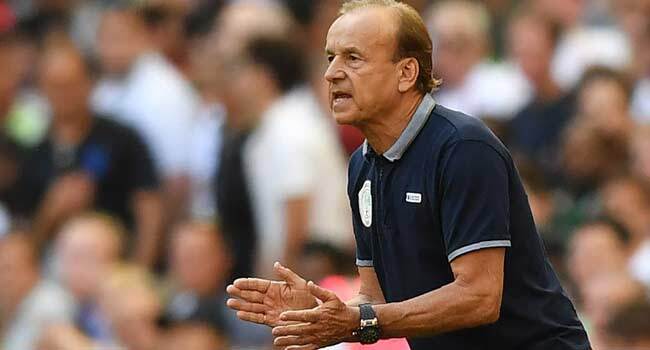 At a world press conference in Lagos on Friday, Rohr, flanked by the first Vice President of the Nigeria Football Federation (NFF), Mr Seyi Akinwunmi and Executive Board Member, Aisha Falode, unveiled a list of three goalkeepers, eight defenders, six midfielders and seven forwards. He also put four other players, including former U17 World Cup –winning captain Musa Muhammed, on standby. The three goalkeepers are those who made the final cut for the FIFA World Cup finals in Russia in the summer, but the defence has two new boys. England – based Semi Ajayi and Germany – based Jamilu Collins, while Olaoluwa Aina, overlooked for the World Cup, has been recalled. Another former U17 World Cup – winning captain, Kelechi Nwakali, is the new face in the middle, just as France – based Samuel Kalu is the new man up front. Henry Onyekuru, who got injured before the World Cup, has also been recalled. Team Administrator Dayo Enebi Achor told the NFF on Friday that the invited players were expected to fly directly to Seychelles and arrive on Monday, September 3. He added that goalkeeper Ikechukwu Ezenwa and team officials travelling from Nigeria will fly into Victoria on Sunday, September 2.